In the basement of Hakata Station, there's a fancy depachika with plenty of fresh foods as well as fancy treats. I walked past a bagel shop and noticed a unique flavor: beets & grapefruit. 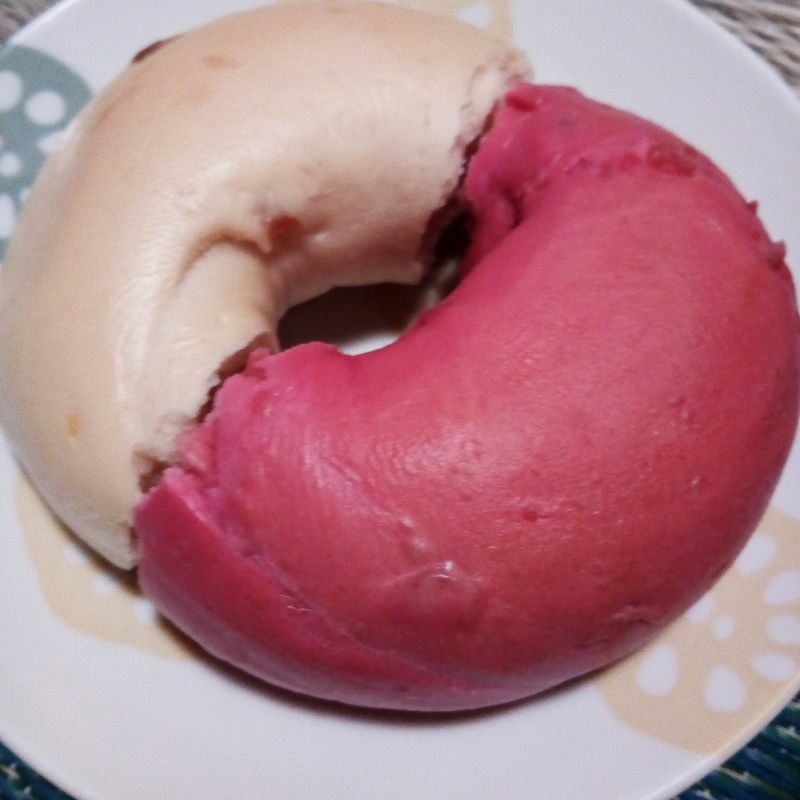 I was curious, but looked around some more and ended up finding it again because I wanted to try a beet bagel. (I love beets) There are several other unique flavors and I ended up getting an apricot flavored bagel as well. They're quite expensive at 240 yen per bagel, but bagels are rare in Japan. They also sell sandwiches made from bagels that looked yummy. Some used fancy cream cheese, but some had the usual veggies / meat inside too. As I was traveling for a while before eating and it's still hot, I didn't want to buy a sandwich. I shared the bagels with my husband, and really wasn't impressed. Besides the fact that the flavors were unusual, the bagels aren't good unfortunately. It's mostly that I've had decent bagels in the US before (crisp on the outside and soft on the inside) but these were typical bad Japanese bagels. Just dry and dense bread. They might work better as a sandwich or toasted, but I don't think I'll be trying again. The first shop is in Setagaya Tokyo, and there seem to be several locations if you're interested to check out this chain. Cool aesthetics but not the easiest mall to navigate!